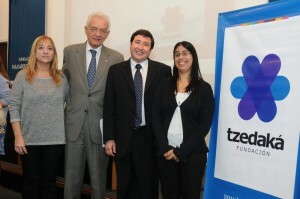 ESOMAR Foundation announced today it had awarded its first 2014 Local Initiatives Programme grant to Argentinian local charity Fundación Tzedaká. The grant, worth a minimum of €5000 has been earmarked to support the Fundación Tzedaká’s UNI© Support Program for University Students supporting disadvantaged young persons to accede to university and break the cycle of poverty for themselves and their families. ESOMAR Foundation, founded in 2013, is the foundation of the market, social, and opinion research sector channelling the expertise and resources of the sector to achieve social good. Through its funding programmes, the ESOMAR Foundation supports researcher families facing emergency situations, access to education on market, social, and opinion research, charities, and the philanthropic sector. Fundación Tzedaká, founded in 1991, directly supports more than 11.000 Argentinians in poverty, with the help of over 100 paid staff, and 600 volunteers. The support programme UNI© ensures young people will be given a chance to acquire the tools they need to achieve their life goals and break the intergenerational poverty cycle they live in. The grant will support activities aiming to achieve a series of specific goals including enabling university and tertiary studies completion; contributing to better insertion of young adults living in poverty into the job market; and fostering the social commitment of young adults, particularly women, to the values of solidarity and social justice. This aligns fully with the objectives of ESOMAR Foundation’s Local Initiatives Programme, which supports local charitable activities to continue to be the champions of social change in their countries. The programme is open to local charities operating in countries where sister society ESOMAR organises its major regional and global events throughout the year. Both ESOMAR Foundation and Fundación Tzedaká are delighted to be able to provide a select group of disadvantaged Argentinian youth the opportunity to break the cycle of poverty and to achieve their dreams by attending university programmes of their choice. Both organisations will be communicating the achievements of the project in the hopes of inspiring further support to the UNI© programme.